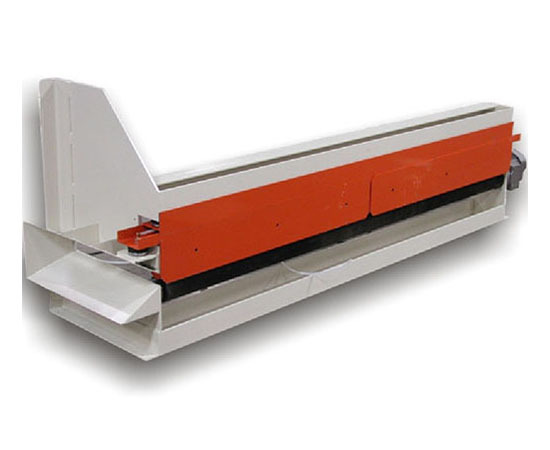 Systec's patent pending De-Sheeter Device (DSD) is a very simple, yet very effectively engineered product for removing deck, or waste sheets from corrugated unit loads. The DSD is ideal for facilities that process delivered, unitized sheets. Converting machines that have automatic prefeeders must have the deck sheet removed and the DSD is perfectly suited for this application. Operators' are not required to stand on the conveyor to un-band the unitized load. Banding can simply be broken and pulled from the load while standing alongside the conveyor. The operator can then fold down the deck sheet(s) which are funneled into the DSD as the conveyor automatically transfers the load to the DSD. Once the load is centered on the device, the DSD is actuated to grip and pull the deck sheet from beneath the load, while the integral backstop keeps the load together and square. After the de-sheeting is done, the load can then transfer to the next operation.